Industrial Powersource’s Service Department is second to none. 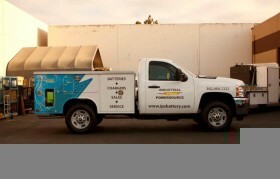 Our battery and charger technicians are professional, efficient and dependable and provide timely and reliable service. IPS is best in the industry. We will assist you in developing a cost-effective plan that will benefit your daily operations. Our 24 hour emergency service and consistent two hour response time will ensure your production is never compromised. Our service department maintains rental batteries and chargers at our facility, to minimize customers’ downtime. We will be YOUR one stop shop for all your industrial battery/charger needs.